The Bright and Morning Star is not a creator, but he is a marvelous administrator, being the personal administrative representative of the Creator Son. Aside from creation and life impartation the Son and the Spirit never confer upon important universe procedures without Gabriel's presence. Gabriel is the chief officer of execution for superuniverse mandates relating to nonpersonal affairs in the local universe. Most matters pertaining to mass judgment and dispensational resurrections, adjudicated by the Ancients of Days, are also delegated to Gabriel and his staff for execution. Gabriel is thus the combined chief executive of both the super- and the local universe rulers. He has at his command an able corps of administrative assistants, created for their special work, who are unrevealed to evolutionary mortals. In addition to these assistants, Gabriel may employ any and all of the orders of celestial beings functioning in Nebadon, and he is also the commander in chief of "the armies of heaven" —the celestial hosts. Gabriel is the chief executive and actual administrator of Nebadon. Michael's absence from Salvington in no way interferes with the orderly conduct of universe affairs. During the absence of Michael, as recently on the mission of reunion of Orvonton Master Sons on Paradise, Gabriel is the regent of the universe. At such times Gabriel always seeks the counsel of Immanuel of Salvington regarding all major problems. After a study of the special report on the status of segregated worlds prepared by the Melchizedeks, in counsel with Gabriel, Michael finally chose Urantia as the planet whereon to enact his final bestowal. Subsequent to this decision Gabriel made a personal visit to Urantia, and, as a result of his study of human groups and his survey of the spiritual, intellectual, racial, and geographic features of the world and its peoples, he decided that the Hebrews possessed those relative advantages which warranted their selection as the bestowal race. Upon Michael's approval of this decision, Gabriel appointed and dispatched to Urantia the Family Commission of Twelve—selected from among the higher orders of universe personalities—which was intrusted with the task of making an investigation of Jewish family life. When this commission ended its labors, Gabriel was present on Urantia and received the report nominating three prospective unions as being, in the opinion of the commission, equally favorable as bestowal families for Michael's projected incarnation. "While your husband, Zacharias, stands before the altar in Jerusalem, and while the assembled people pray for the coming of a deliverer, I, Gabriel, have come to announce that you will shortly bear a son who shall be the forerunner of this divine teacher, and you shall call your son John. He will grow up dedicated to the Lord your God, and when he has come to full years, he will gladden your heart because he will turn many soul to God, and he will also proclaim the coming of the soul-healer of your people and the spirit-liberator of all mankind. Your kinswoman Mary shall be the mother of this child of promise, and I will also appear to her." For five months, however, Elizabeth withheld her secret even from her husband. Upon her disclosure of the story of Gabriel's visit, Zacharias was very skeptical and for weeks doubted the entire experience, only consenting halfheartedly to believe in Gabriel's visit to his wife when he could no longer question that she was expectant with child. Zacharias was very much perplexed regarding the prospective motherhood of Elizabeth, but he did not doubt the integrity of his wife, notwithstanding his own advanced age. It was not until about six weeks before John's birth that Zacharias, as the result of an impressive dream, became fully convinced that Elizabeth was to become the mother of a son of destiny, one who was to prepare the way for the coming of the Messiah. While he tarried on the mountain, talking with Gabriel, the Constellation Father of Edentia appeared to Jesus and Gabriel in person, saying: "The records are completed. The sovereignty of Michael number 611,121 over his universe of Nebadon rests in completion at the right hand of the Universal Father. I bring to you the bestowal release of Immanuel, your sponsor-brother for the Urantia incarnation. You are at liberty now or at any subsequent time, in the manner of your own choosing, to terminate your incarnation bestowal, ascend to the right hand of your Father, receive your sovereignty, and assume your well-earned unconditional rulership of all Nebadon. I also testify to the completion of the records of the superuniverse, by authorization of the Ancients of Days, having to do with the termination of all sin-rebellion in your universe and endowing you with full and unlimited authority to deal with any and all such possible upheavals in the future. Technically, your work on Urantia and in the flesh of the mortal creature is finished. Your course from now on is a matter of your own choosing." His own way—the way that might seem most pleasant and profitable from the standpoint of the immediate needs of this world and the present edification of his own universe. It was about three o'clock on this beautiful afternoon that Jesus took leave of the three apostles, saying: "I go apart by myself for a season to commune with the Father and his messengers; I bid you tarry here and, while awaiting my return, pray that the Father's will may be done in all your experience in connection with the further bestowal mission of the Son of Man." And after saying this to them, Jesus withdrew for a long conference with Gabriel and the Father Melchizedek, not returning until about six o'clock. When Jesus saw their anxiety over his prolonged absence, he said: "Why were you afraid? You well know I must be about my Father's business; wherefore do you doubt when I am not with you? I now declare that the Son of Man has chosen to go through his full life in your midst and as one of you. Be of good cheer; I will not leave you until my work is finished." As they partook of their meager evening meal, Peter asked the Master, "How long do we remain on this mountain away from our brethren?" And Jesus answered: "Until you shall see the glory of the Son of Man and know that whatsoever I have declared to you is true." And they talked over the affairs of the Lucifer rebellion while seated about the glowing embers of their fire until darkness drew on and the apostles' eyes grew heavy, for they had begun their journey very early that morning. At ten minutes past three o'clock, as the resurrected Jesus fraternized with the assembled morontia personalities from the seven mansion worlds of Satania, the chief of archangels—the angels of the resurrection—approached Gabriel and asked for the mortal body of Jesus. Said the chief of the archangels: "We may not participate in the morontia resurrection of the bestowal experience of Michael our sovereign, but we would have his mortal remains put in our custody for immediate dissolution. We do not propose to employ our technique of dematerialization; we merely wish to invoke the process of accelerated time. It is enough that we have seen the Sovereign live and die on Urantia; the hosts of heaven would be spared the memory of enduring the sight of the slow decay of the human form of the Creator and Upholder of a universe. In the name of the celestial intelligences of all Nebadon, I ask for a mandate giving me the custody of the mortal body of Jesus of Nazareth and empowering us to proceed with its immediate dissolution." A little after half past four o'clock this Sunday morning, Gabriel summoned the archangels to his side and made ready to inaugurate the general resurrection of the termination of the Adamic dispensation on Urantia. When the vast host of the seraphim and the cherubim concerned in this great event had been marshaled in proper formation, the morontia Michael appeared before Gabriel, saying: "As my Father has life in himself, so has he given it to the Son to have life in himself. Although I have not yet fully resumed the exercise of universe jurisdiction, this self-imposed limitation does not in any manner restrict the bestowal of life upon my sleeping sons; let the roll call of the planetary resurrection begin." The circuit of the archangels then operated for the first time from Urantia. 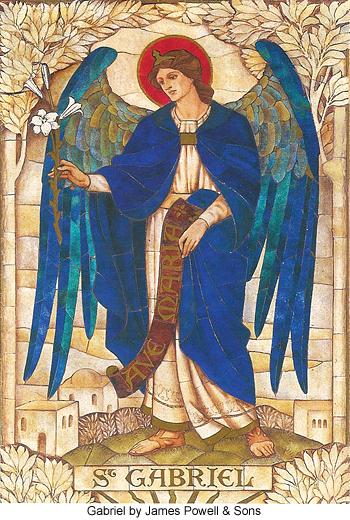 Gabriel and the archangel hosts moved to the place of the spiritual polarity of the planet; and when Gabriel gave the signal, there flashed to the first of the system mansion worlds the voice of Gabriel, saying: "By the mandate of Michael, let the dead of a Urantia dispensation rise!" Then all the survivors of the human races of Urantia who had fallen asleep since the days of Adam, and who had not already gone on to judgment, appeared in the resurrection halls of mansonia in readiness for morontia investiture. And in an instant of time the seraphim and their associates made ready to depart for the mansion worlds. Ordinarily these seraphic guardians, onetime assigned to the group custody of these surviving mortals, would have been present at the moment of their awaking in the resurrection halls of mansonia, but they were on this world itself at this time because of the necessity of Gabriel's presence here in connection with the morontia resurrection of Jesus.